NEW YORK — Mookie Betts is ready to become an ambassador for baseball, now that he’s won a batting title, World Series and Most Valuable Player award with Boston. “I enjoy being kind of a face around the game. I’ve kind of used this pedestal or whatever you want to say to spread knowledge that the game is fun,” he said Thursday after his runaway victory for the AL MVP award. Milwaukee’s Christian Yelich was close to a unanimous pick for the NL honor. 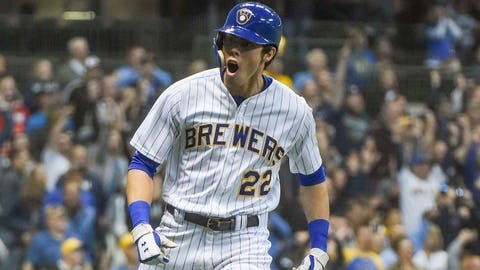 A 26-year-old outfielder just like Betts, Yelich also won a batting championship and led his team to a division title. But while Betts has been with the Red Sox since he signed after the 2011 amateur draft, Yelich didn’t join the Brewers until he was dealt to Milwaukee last January by the payroll-paring Miami Marlins. Yelich is signed through 2021 and his deal includes a team option for the following season. Betts didn’t want to speculate whether he would be a Red Sox lifer, like former Boston MVPs Ted Williams, Carl Yastrzemski and Jim Rice. Betts can become a free agent after the 2020 season. “Right now I’m just focusing on the 2019 season coming up,” he said. Betts received 28 first-place votes and 410 points from the Baseball Writers’ Association of America. Los Angeles Angels outfielder Mike Trout, a two-time MVP, followed with one first-place vote and 265 points. Trout tied the record of four second-place finishes shared by Stan Musial, Williams and Albert Pujols. Trout won in 2014 and 2016, finished second in ’12, ’13 and ’15, and was fourth in 2017. Betts, second to Trout in the 2016 vote, raised his profile when he fed homeless people on the steps of Boston’s Public Library after the second game of the World Series. Unlike some baseball players, he doesn’t eschew off-the-field limelight. Commissioner Rob Manfred criticized Trout during the All-Star Game for not making enough of a marketing effort. Milwaukee reached the playoffs for the first time in seven years, swept Colorado in the Division Series then lost to the Los Angeles Dodgers in a seven-game League Championship Series, falling one win short of its first World Series appearance since 1982.